The BiliSoft™ 2.0 Phototherapy System helps provide family-centered care virtually anywhere—in the NICU, pediatrics units, well-baby nurseries, and even at home. The right touch—and blue light—can make all the difference for infants with jaundice. GE Healthcare’s BiliSoft 2.0 Phototherapy System meets or exceeds the American Academy of Pediatrics (AAP) guidelines for intensive phototherapy to effectively treat hyperbilirubinemia and support even the tiniest patients with more comfort, better bonding, and higher quality developmental care. With BiliSoft 2.0, there’s no barrier to bonding between infant and parents or caregivers. The baby can be held, fed, even rocked throughout the therapy session, promoting a healing environment without interrupting the benefits of kangaroo care. With the benefits of kangaroo care well-documented, more hospitals are encouraging and supporting healthy, healing, “baby friendly” interactions and practices. BiliSoft 2.0 delivers phototherapy anywhere—in the neonatal ICU, pediatrics, well-baby nursery or at home. It can be used with a radiant warmer, incubator, bassinet, crib, or while in a caregiver’s arms. Additionally, the flat, cushioned BiliSoft 2.0 cover lets you swaddle the baby and phototherapy pad together. The long-lasting, high–spectral–irradiance, blue LED light delivers healing phototherapy that meets and exceeds the recommendations of the AAP1. Positioning aids may also be placed under the pad to bring more light to the sides of a baby’s body for greater skin surface area exposure to the light. Thanks to a small footprint and lightweight design, the BiliSoft 2.0 can be easily mounted to a bed or roll stand, providing added flexibility, space conservation in small care areas, and quicker access when the baby needs hands-on care. Plus, its long, flexible fiber-optic cable makes positioning easier and provides greater coverage than other fiber-optic devices and many overhead lamps. The pad design also helps to eliminate distance deficiencies. The Giraffe* Blue Spot PT Lite offers high-intensity phototherapy for effective treatment of hyperbilirubinemia. 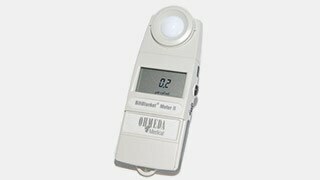 BiliBlanket* Light Meter II provides a reliable measure of light emissions from phototherapy systems. 1. Bhutani, V and the Committee on the Fetus and Newborn, (2011). Phototherapy to Prevent Severe Neonatal Hyperbilirubinemia in the Newborn Infant 35 or More Weeks of Gestation. Pediatrics, e1054.